Kit Dorey who interns in MRG’s Europe office, Budapest, shares his experience from one of the activities organized to mark Action Against Racism week. See Part 1 and Part 2. A Tour of the Jewish Quarter would not make sense without stopping outside the Grand Synagogue of Dohany utca, which is where we met today. Now the setting for the Hungarian Jewish Museum and the Raoul Wallenberg Holocaust Memorial Park, it was built as the centre of Neolog Judaism. This is a form of Judaism that began in the late 19th Century as a response to the modernism of the period, and as a foil to the predominately Orthodox population. 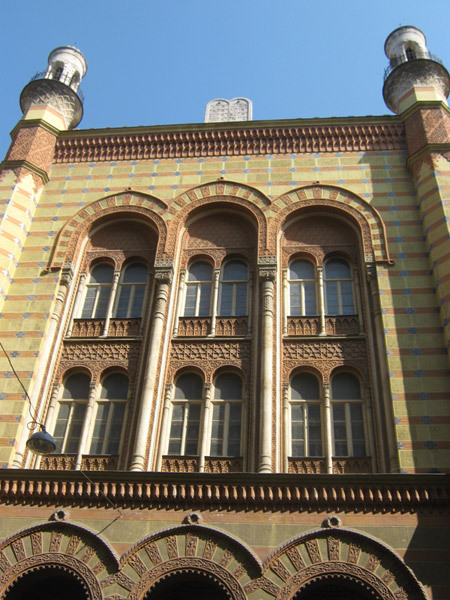 In fact, thanks to Zoltan’s expert knowledge of the area, we were able to see for ourselves the development of Jewish theology in the city, represented by the variety of synagogues serving different religious branches. Firstly, we were lucky to be allowed to investigate the Orthodox Jewish compound on Dob utca, hidden from the main street and equipped with kosher butcher, yeshiva (Jewish school) and place of worship. We also went to see the remains of the synagogue that lies on Rumbach utca. This particular synagogue was built as a place for those who did not want to follow the stricter rules of Orthodoxy, but also did not appreciate the modernity of the Neologs, perhaps taking a position comparable to the one that Anglicans and Episcopalians take in relation to Catholics and Lutherans. This building, pictured here, has an especially emotive significance, as it was used to collect the Hungarian Jews before they were taken to concentration camps in May 1944. Nowadays, robbed of all its fittings, it stands empty and unused. As Zoltan told us at the beginning of the tour, the existence of the so-called “Jewish Quarter” is owed to the laws of the time when Jews began to settle on the other side of the river from the Castle District. The city walls of Pest stood all the way until the middle of the 19th Century, and no Jew was allowed to traverse them. When the walls were taken down, the rules of settlement became less strict, but already by this time there was a thriving community in the seventh district that was happy where it was. Even today, as a greater number of people (descendants of Hungarian Jewish émigrés) return to the city, they tend to repopulate the same area in which their ancestors lived. After visiting four synagogues, three of which still operate and host thriving congregations, it is a validating experience to see how Jewish culture and religion continue to shape the atmosphere of this district to such a large extent. After leaving the old Jewish Quarter, we made our way downtown, towards the Danube River, where we set about exploring the history of the various strands of Orthodox Christianity, which came with the centuries-old settlement of an assortment of national minorities. We started with the Romanian Orthodox Church on Hollo utca, where Zoltan’s contact, Father David (pictured with Zoltan here), met us to talk about his congregation and the history of the building. The church is hidden in what looks from the outside like a regular apartment building, so it was extremely strange to pass through the gate and be faced with nuns and icons. Father David told us that he regularly gets a congregation of around 200, who come from all around the city, and it was refreshing to hear that the political antagonism that sometimes appears between Romania and Hungary had not transferred itself into relations with his community. 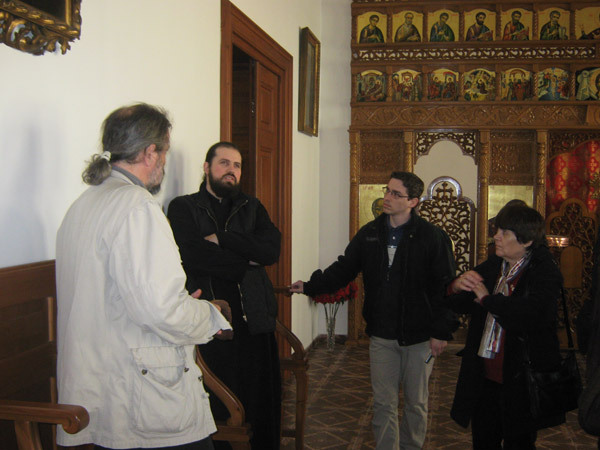 Our next stop was the Greek Orthodox Church, only a couple of streets away, to meet Father Kirill. 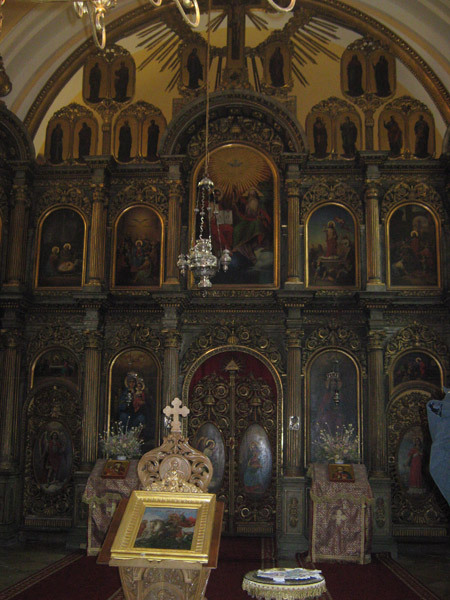 The Greek Orthodox Church is an extremely grand affair: the front wall of the nave is absolutely covered in beautifully painted icons and towers above decorated lecterns. The Greeks, as Father Kirill pointed out to us, have a very long history of settlement in Hungary, and there are many Hungarians around today who can claim Greek ancestry. However, the history of Greek settlement in Hungary is not quite as long as the history the Serbs, which dates back to the Middle Ages, as we learnt when we met Borislav Rusz, from the Centre for Serbian Minority Self-Government, at the Serbian Orthodox Church. The largest number of Serb immigrants arrived in 1690, after the Hapsburgs took control of this territory. After the arrival of about 40,000 families, for a short while Serbs were the ethnic majority in Buda, Pecs, Szeged and Sezentendre, and many of these families stayed in order to integrate with the local Hungarian population. Although the numbers are not as high as they once were, Serbians still have a long and dignified history of settlement in and relations with Hungary and, ever since 1993, when the Minority Act of the Hungarian Constitution recognized the Serbs as one of the 13 official national and ethnic minorities of Hungary, the Serbs (along with the Greeks and Romanians) have shared rights to a certain level of independent governance and cultural autonomy. This autonomy has ensured the survival of their traditions to the current day. However, a serious point came out of Borislav’s words. 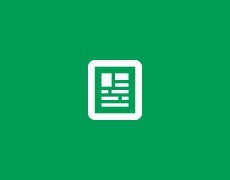 The new government of Hungary is set to reevaluate the constitutional protection of the relative independence of minority groups. No one is yet sure what will come out of these discussions, but there is a concern that they will impinge on the historical freedom of many of the minority citizens of Hungary, including the Romanian, Greek and Serbian communities we have been privileged to investigate today. For all those that understand the significance and value of diversity in political life, let us hope that whatever comes out of these talks does not impinge too heavily on the national and ethnic minorities, of all kinds, that live in Hungary today. 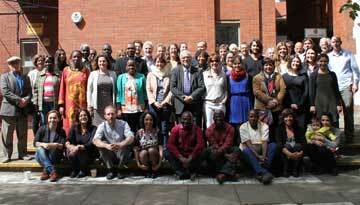 This was the last of our guided tours to mark the EU Action-Week Against Racism. For all those who live in Budapest, please take the time to view these places for yourself, as well as other parts of the city we have not been able to visit. For all those who live outside Budapest, I would encourage you to discover the history of minority communities in your own country and to explore both their historical traces and their present situation. These tours were developed and delivered by Minority Rights Group, Szubjektív Értékek Alapítvány and Rockhoppers. Please view www.rockhoppers.hu if you are interested in exploring minority Budapest further.